M.Sc. Arch. Vladyslav Tyminskyi is an architect, researcher, and consultant on strategic urban design and spatial planning. Since 2018 he is a Ph.D. Candidate at the University of Stuttgart, Faculty of Architecture and Urban Planning, focused on the study of urban policy mobilities for understanding the process of transferring strategic spatial planning — an approach which was originated in the global North and has been introduced in the specific context of contemporary Ukrainian cities. Vladyslav Tyminskyi obtained his Master’s degree in Architecture at Kharkiv National University of Civil Engineering and Architecture (Kharkiv, Ukraine) in 2012 and completed a postgraduate research program ‘Big Future’ at Strelka Institute for Media, on Architecture and Design (Moscow, Russia) in 2015. 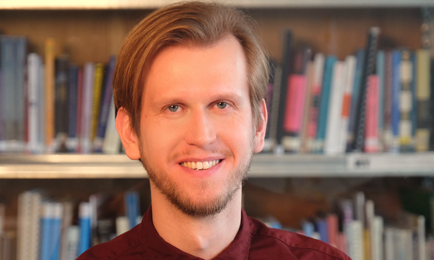 As a researcher, he is focused on strategic spatial planning and integrated urban development, urban policy transferring, alternative forms of governance in the context of contemporary urban development in Central Eastern Europe. In 2015-2018 he worked at CANactions School for Urban Studies (Kyiv, Ukraine) as an Education Program Director and a Co-curator of Education. In 2016 the research projects of the School were presented at the Venice Architecture Biennale as a part of the Urban-Think Tank (Zurich, Switzerland) pavilion. While working at CANactions School, he was a guest tutor in the framework of academic events in Romania, Serbia, Lithuania, Belarus, Germany, and France. In 2016-2017 he worked for two GIZ projects in Ukraine — ‘Integrated Urban Development’ and ‘National Urban Development Policy (NUDP)’ as a Chief Urban Researcher and External Consultant on Urban Planning and Urban Management. The projects have been aimed at introducing in Ukraine integrated urban development principles on the municipal and national level respectively. In 2013 he was an Executive Editor and author of articles for the almanac ‘Urban Studies: Politics and Practices of Urban Renewal’ supported by Heinrich Boell Foundation in Ukraine. Tyminskyi, V; Van De Wetering, H; Thomann, U (2016): Contemporary Urban Development in Ukraine: The Vinnytsia Case. Mistosite. Accessed May 15, 2018. https://mistosite.org.ua/ru/articles/contemporary-urban-development-in-ukraine-the-vinnytsia-case. Tyminskyi, V (2013): Have Post-soviet Cities Got a Future?In: Urban Studies: Politics and Practices of Urban Renewal (Supported by Heinrich Boell Foundation in Ukraine), edited by S. Schlipchenko, V. Tyminskyi, et al., 205-216. Kyiv: PE Moskalenko O.M. Tyminskyi, V; Kamyshan, A (2012): Svitlovodsk: Realized Utopia of the USSR.DO.CO.MO.MO. International Journal46 (Summer 2012): 80-82. ‘Contemporary Challenges for the Development of Liveable Cities in Germany and Ukraine’. A keynote presentation at the 2ndGerman-Ukrainian Conference on Urban Development ‘Liveable Cities’ (Lviv, Ukraine).